When I started it I was real skeptical if I was going to enjoy it or not. And honestly it took at least the first two chapters for me to really get into the book. The first two chapters are basically a background of all of the many chapters in this book. It is not a book that revolves around just one character but instead it is book that revolves around numerous characters and to be honest I do think that it would have flowed with the ease that it did without each and everyone of the characters that are in it. 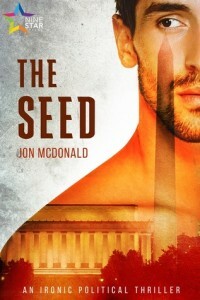 After the first two or so chapters, that is when Jon McDonald really let loose and the story just seemed to roll off the pages. If I had to describe this book I would say that it is a book that is about a corrupt President, a team of people that work for the president that does not offer him hardly any good advice but instead they play into his crazy schemes and make him even worse as a president. But that is not all as far as describing this book….. It is also about a woman who wants revenge and decided to take matters into her own hands. It is a book about a murdering Ceo of an oil company because let’s just be honest…. He is crazy any way you look at it. Then you throw the son of the president who does whatever is necessary to try and right the wrongs of his father even if it means throwing the father under the bus. Not to mention the ex wife of the president who can make you laugh at any given point but is also an all around wonderful person and mother and a daughter of the president who is just clueless that is until she is not and you have a book that is just impossible to put down. And that is not even half of the characters in the book. I would definitely recommend those that like a book with mystery, murder, corruption, sinister plans, heart break, revenge, and even happy endings… Then this is the book for you. I truly enjoyed this read and I believe that many others will also. Great work on never letting anyone figure out what was coming next or who is was going to happen to or where. Jon McDonald did an amazing job with this book especially with everything that was going on it. It flowed well and there is always something exciting happening.